The Museum of London Archaeology built heritage team has recorded a possible-Medieval, secular wall painting during refurbishment works at Valence House, Barking and Dagenham. The timber-framed building, partially surrounded by a moat, is the only surviving example of the five manor houses of Dagenham. It is now home to Barking and Dagenham’s local history museum and art gallery, which is undergoing a major redevelopment. 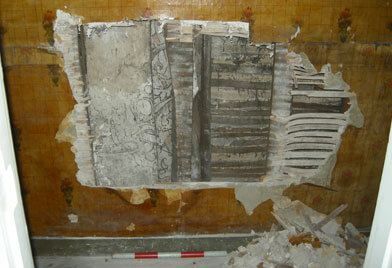 The painting was uncovered on the northern wall of a cupboard, as well as on a ceiling timber in the same cupboard. The discovery was made in an area of the building thought to date to the 15th century, and there is no initial reason to think the decoration is of significantly later date. The painted decoration was sealed behind lath and plaster which, on the northern wall of the cupboard, had been attached to inserted timber studs with what appeared to be hand-wrought nails, suggesting that the painted decoration was covered over no later than the 19th century. The painted surfaces could be seen to extend beyond the hole both to the top and bottom. It is possible that the painted decoration extends from floor to ceiling behind the present surface of the wall. Museum of London Archaeology is consulting with English Heritage and the local conservation authority about the significance of the painting before works continue.